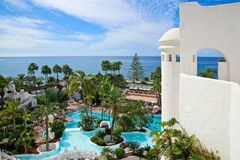 The Jardin Tropical is a superior 4* hotel, located in idyllic situation on the Costa Adeje on Tenerife's South coast, looking out over the Atlantic Ocean and the picturesque island of La Gomera. The modern hotel is set in the midst of lovely sub-tropical gardens, and is perfectly equipped to provide excellent hospitality for your next golfing holiday to Tenerife. The hotel is adjacent to Golf Costa Adeje, and has 390 recently refurbished bedrooms, all specifically designed to ensure maximum comfort and convenience. Every room is complete with a private balcony or terrace, plasma screen satellite television, mini-bar and safe deposit box. With the great access to the beach and the golf courses of the island, the Jardin Tropical is a superb choice as a base for a golf holiday in Tenerife. The Jardin Tropical has a hairdressing and beauty salon, where you can be pampered to your heart's content, while signature treatments include hot stone massage and reflexology. With a fitness suite, Turkish bath and relaxation area, all surrounded by tropical plants, the complex is the perfect place to unwind. The Jardin Tropical is home to 4 separate restaurants - a personal favourite is Las Rocas, set on a spectacular cliff edge. The hotel's beach club is the perfect place to watch the sun set over the idyllic island of La Gomera. We had an excellent week and the hotel has been refurbished very well and is much improved on our previous stays.